“I’m constantly moving, which stops me from navel-gazing all day and becoming fossilised,” said Karl Lagerfeld in a recent interview with Numero. (In the same interview he reveals his qualms with #MeToo, his self-deprecating sense of humour, and incisive and uncompromisingly exact responses to the interviewer’s vaguer questions.) Perhaps this is how the German has outlasted his peers, designing at Fendi since 1965, his eponymous label since 1974 and Chanel since 1983. At Fendi, for Fall 2018, he underscored his tireless desire to explore the confines of modernity by opting to revive logo-mania and introduce a collaboration with Italian sportswear brand Fila. Lagerfeld’s reintroduction of the interlocking F logo perhaps comes as a response to the vintage movement’s proliferation in recent years, the resurrection of the Baguette. Not to mention, the patronage of Kim Kardashian West, Gigi and Bella Hadid, amongst other social media stars, appearing in public and in photoshoots bedecked in the logo. Lagerfeld presented it in socks, fur-accented sweaters, dresses and—of course—accessories. The ‘FF Reloaded’ capsule as it is known was recently feted in London, commemorating its return. The Fila engagement emerged in the advent of the Louis Vuitton x Supreme storm which shifted the landscape of luxury in 2017 and permitted streetwear a place in the context of high fashion. It’s why Virgil Abloh, who began by urbanising Ralph Lauren polos in the mid-2000s before launching his streetwear bait Off-White, the position of artistic director at Louis Vuitton’s men’s division. Scottish artist REILLY reworked the classic Fila logo, using the typography to recreate the Fendi logo. It reminded me of the tongue-in-cheek merchandise from a few years ago: Comme des Fuckdown, Féline, or Homiés, albeit driven much less by comedic effect. However, it’s Lagerfeld’s wry humour which allows such a stunt to work at Fendi. Elsewhere, away from the sportswear references and logo-mania, Lagerfeld investigated the modernity found in 40s classicism. Boxy shapes, swishy skirts and luxurious overcoats were all rendered in such precise tailoring that it looked undeniably modern. Not only that but it was the pinnacle of old world luxury, which contrasted nicely against the logo-mania and Fila facets. 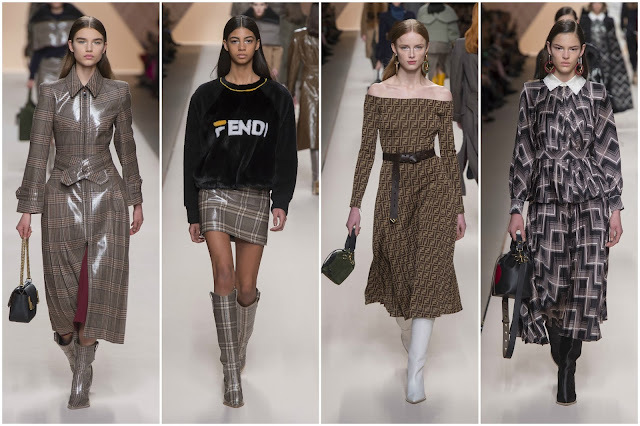 Charlotte Stockdale’s styling, which is often to the detriment of a Fendi collection, was brilliantly wrought this season, conveying a sense of both leisure and luxury. It was a Fendi show in which there was something for everyone. It tampered with cohesion but it oozed a sophisticated modernity that put it in a prominent position as one of Milan Fashion Week’s finest shows. No signs of fossilisation at Fendi.